It’s no secret I am an ice cream fiend (it is hands down my favorite thing to eat, period). 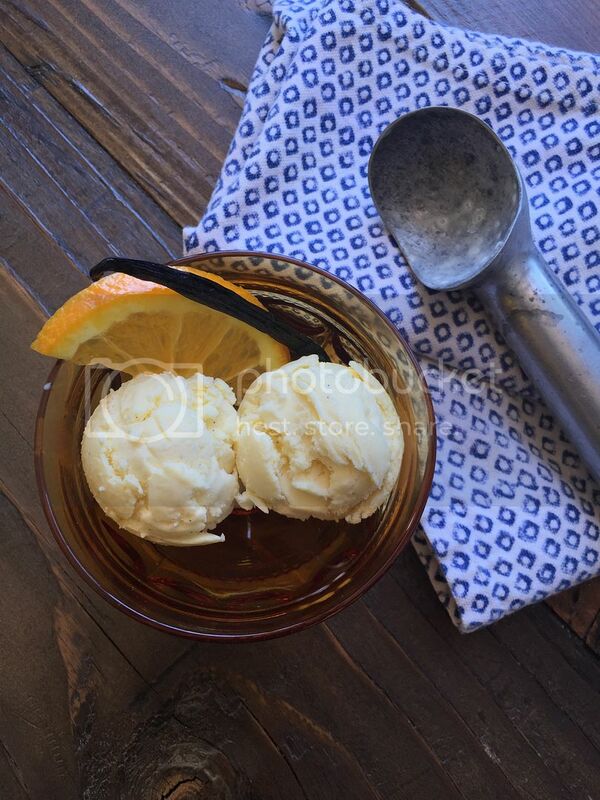 I literally can never get enough and it is difficult to keep it in my house since my self-control goes out the window when I know there’s a pint waiting for me in the freezer… Whenever I have guests over, I love to make my own homemade ice cream as a special indulgence. 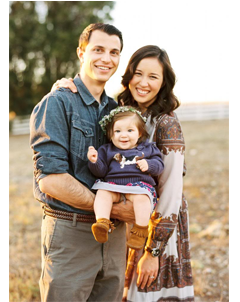 Just a few weekends ago, I had the joy of hosting the Kaisers (Nate, Jac, and their two kiddos Grace and Jasper). 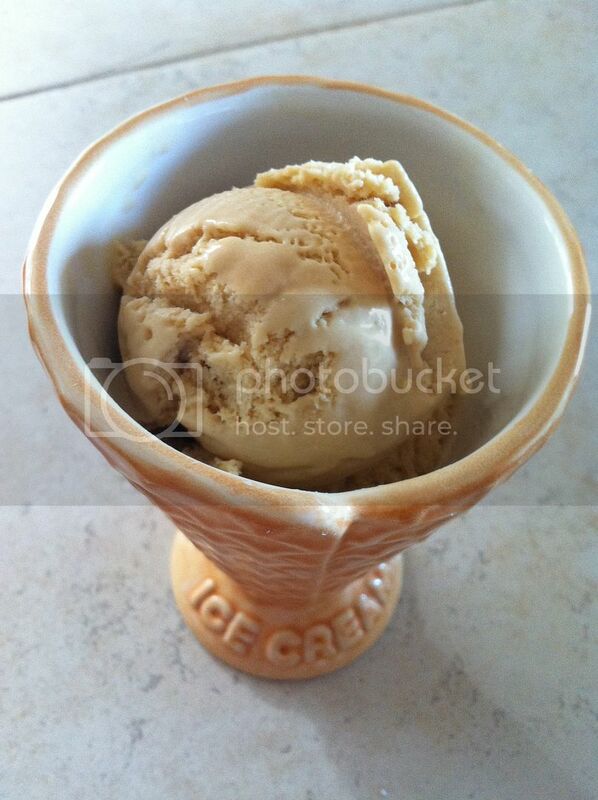 During their last visit, we whipped up a luscious salted butter caramel ice cream. This time around, I let Grace brainstorm some flavor ideas and we picked one together. We landed on a creamsicle-inspired flavor that combined a creamy vanilla bean base with a bright infusion of fresh orange. The result was incredible and I am happy to share the recipe here with you! Prepare an ice bath by filling a large bowl with ice cubes (about halfway) and a bit of water so they are floating. Then placing a metal bowl on top of that so it is surrounded by the ice cubes. You want an extra cold bowl to add your ingredients later. *A key to successful ice cream making is having a completely cold custard (un-churned ice cream) before pouring into your machine. Put a mesh strainer over the metal bowl and pour the cream into it. In a medium saucepan, heat the milk, salt, and sugar until the sugar is melted. Scrape the seeds from the vanilla bean and add to the milk mixture, then throw in the bean pod. Cover, remove from heat and allow custard to infuse up to one hour. Remove bean pod. Now cook the custard over low heat, stirring constantly and scraping the bottom with a silicone spatula, until the mixture is thick enough to coat the spatula. 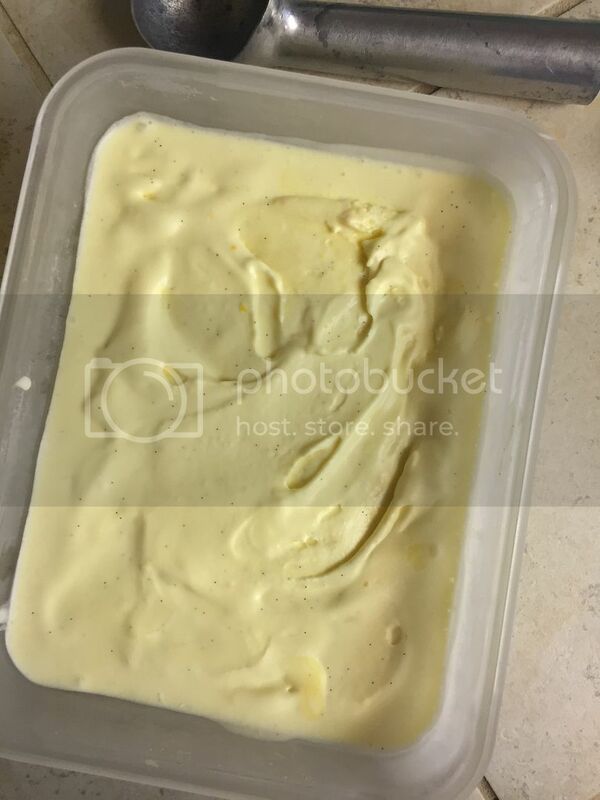 Put the custard into the fridge for at least 4 hours, or ideally overnight. This is a KEY step — your custard must be thoroughly and completely chilled. If not, it won’t freeze completely in the churner and you’ll end up with ice cream soup. When your custard is fully chilled, freeze it in the ice cream maker according to instructions. I use the Kitchen Aid ice cream maker attachment that works with my stand mixer. I love it! Let me know if you try it — it was a definite winner over here! Enjoy and see you again soon! 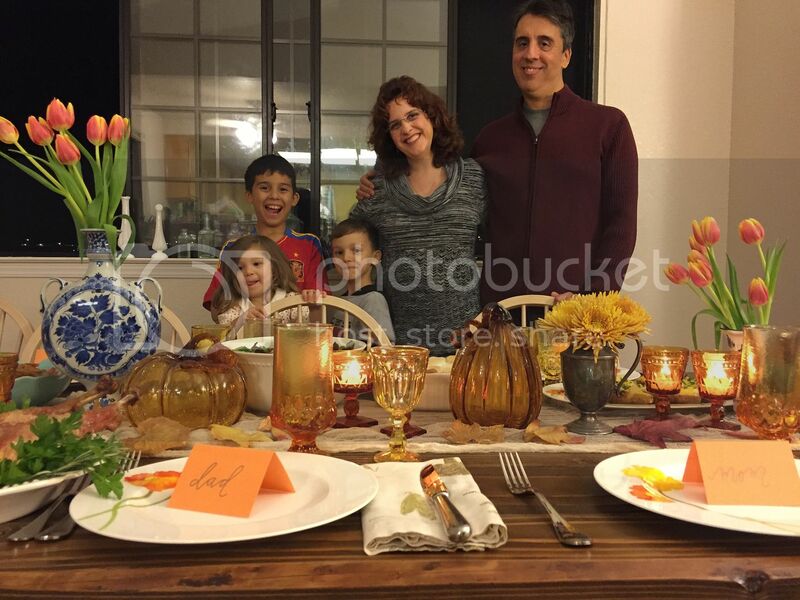 It was such a joy to host our first Thanksgiving this year; in a lot of ways it felt like a rite of passage. Once you’re hosting holidays, I think you’re a bonafide adult. 😉 We have been traveling so much this year that we felt like we just needed to slow down a bit this season. After some discussion, we decided to stay here for Thanksgiving and simply invite our families to join if they were willing. With my sister out of state, and one of Erik’s sisters out of the country (on her honeymoon! ), we knew the family would be a bit spread out. In the end, we hosted just a handful of relatives: my parents and Erik’s eldest sister and her family. Our table of 9 felt perfectly intimate and cozy and we were able to enjoy a wonderful meal along with meaningful company. I especially enjoyed watching Olive playing with her two cousins! She doesn’t get to see them very often so it is a shriek-fest of joy when she is with them. What a blessing! I had my sweet mama here to serve as the ultimate sous chef. She helped me wash, peel and chop vegetables all morning while I tended to each dish. 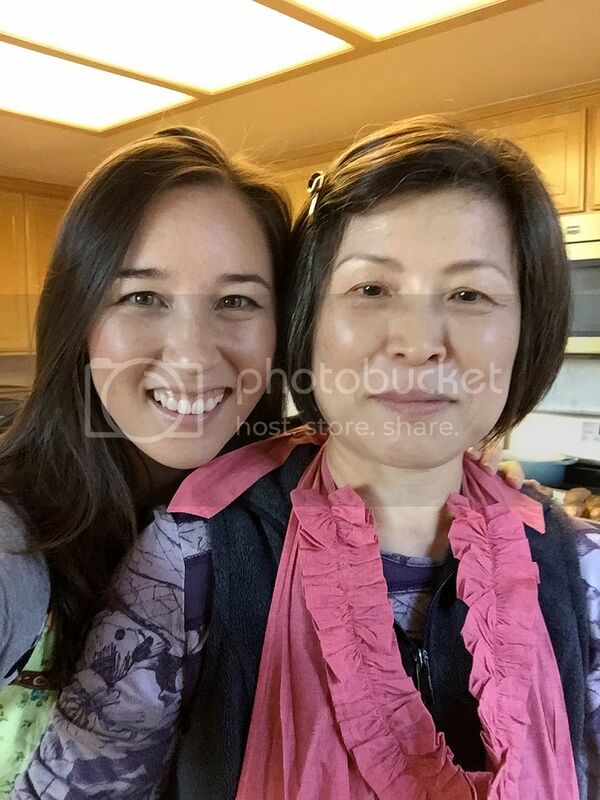 She also washed dishes and countertops, packed up leftovers and helped me make a lovely turkey broth. We shared a lot of great conversation in the kitchen and agreed we ought to do more cooking together. It is such a timeless way to connect parent and child, mother and daughter. Working alongside one another, we laughed and reminisced and taste-tested. I can’t tell you how grateful I am for her beautiful heart of sacrificial service. There is no doubt about it — my mom is the most servant-hearted person I know. The way she works so hard (to this day) to bless me, my sister, and our husbands (and Olive, of course!) convicts me of my own need to serve more. How’s that for gratitude on Thanksgiving?? I loved being the hostess this year; every part of the process delights me. From planning the menu, to shopping for ingredients, to setting the table, I take such pleasure in creating a special experience for my loved ones. You know how they say the cobbler’s children have no shoes? It’s true in the event world, too: we spend so much time planning personalized celebrations for others (whom I love!) that we often skip the effort for our own families. While I know that a get-together (especially Thanksgiving!) does not find its value in perfectly placed flatware and manicured tabletops, I still think there is worth in thoughtful details that make a guest feel special. 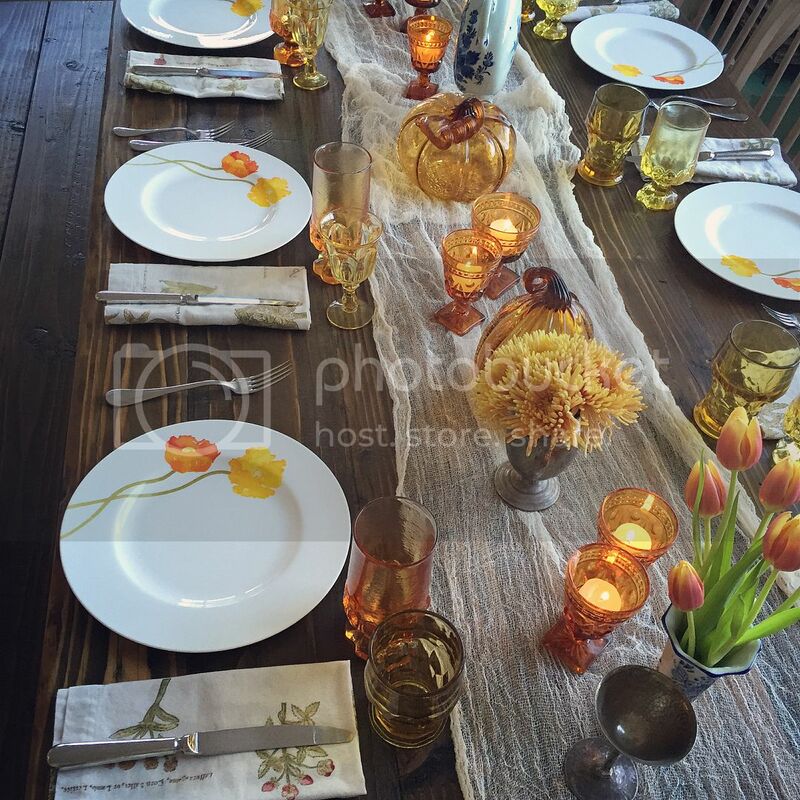 I tea-stained cheesecloths for a simple runner (under $5), gathered Trader Joe’s tulips + spider mums in some vintage brass and Delftware vases from my own collection, and used my own china, flatware, napkins and amber glassware to set the table. 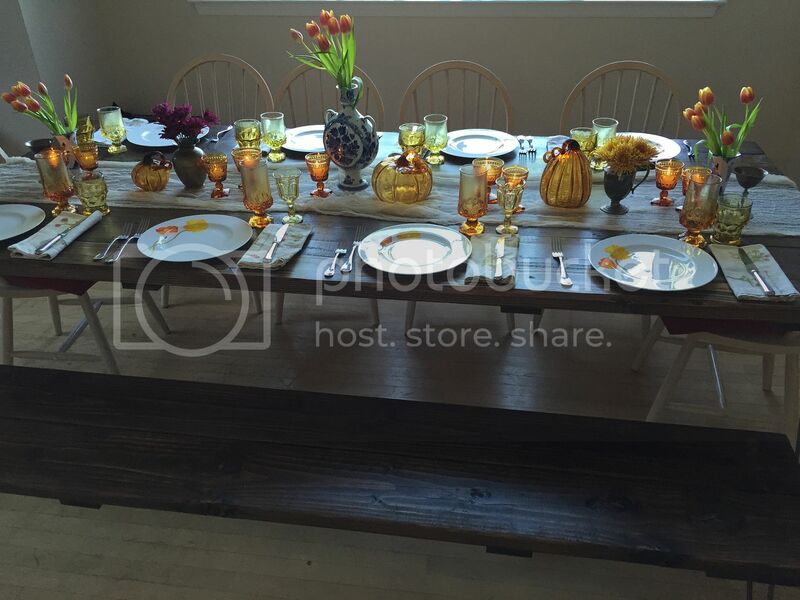 The pumpkins are part of our home’s fall décor — I just moved them from the living room to the dining table. 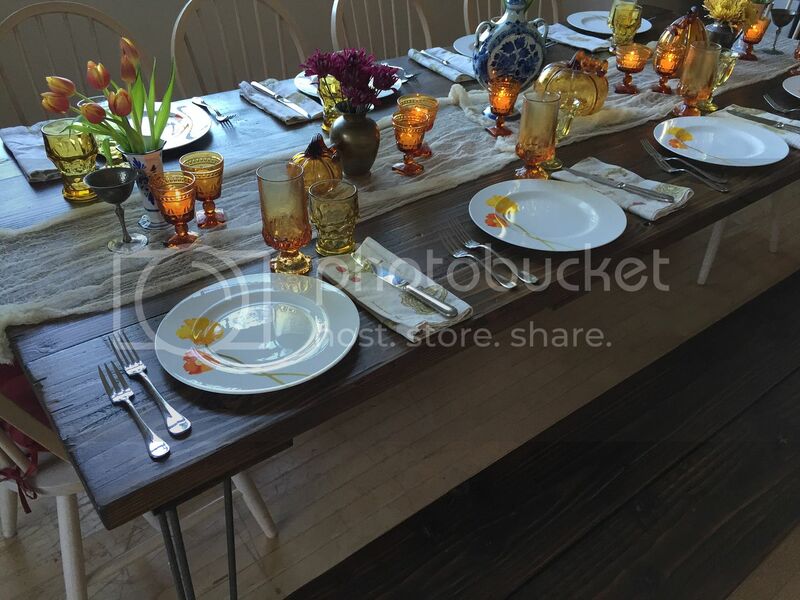 Candles always elevate the formality of a tabletop so I just placed votives into extra amber goblets I had! To top everything off, I foraged some fallen leaves from the neighborhood. And by “foraged,” I mean I pulled over on the side of a road and picked pretty leaves off of someone’s yard while their dog barked menacingly at me. It was hilarious and worth it! 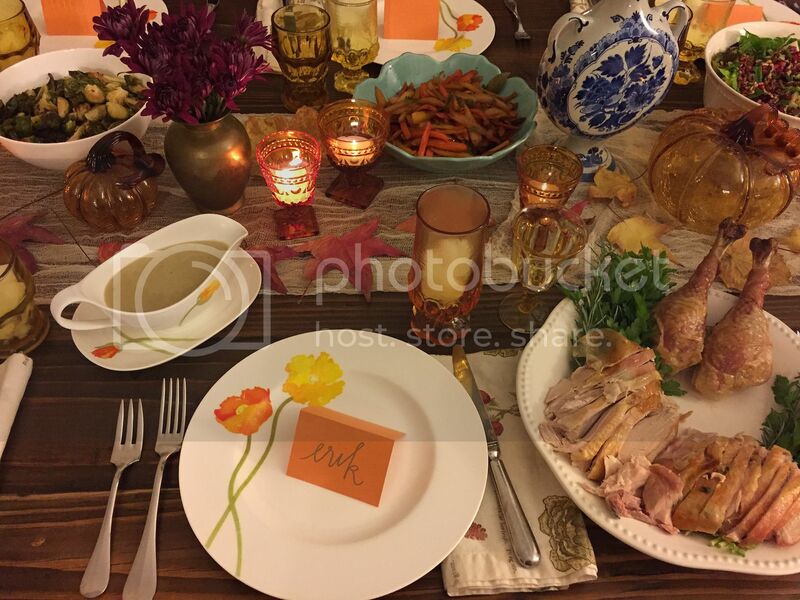 My favorite part of our Thanksgiving table (other than the people around it) was the table itself. 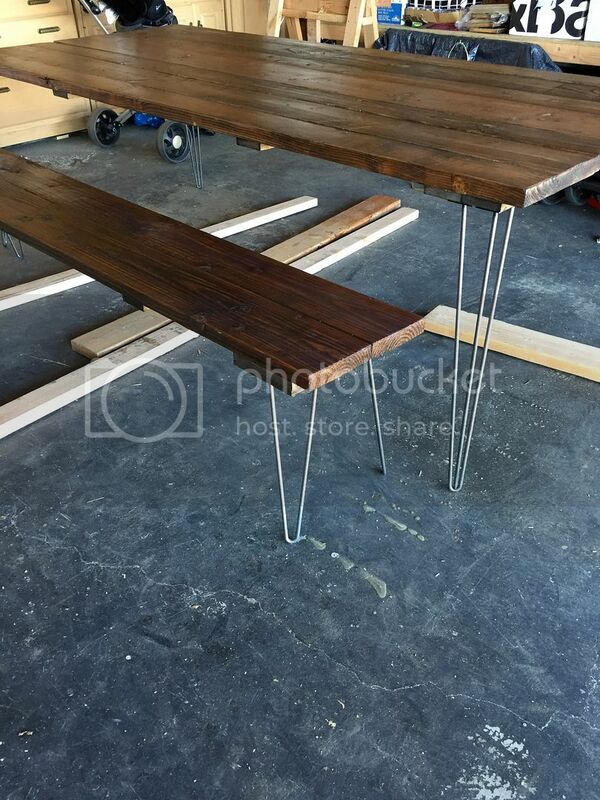 My amazing husband built the table the week before the gathering, using reclaimed wood and US-made steel hairpin legs. He even made a matching bench for one side! We look forward to hunting for just the right vintage chairs to complete the set; on Thanksgiving we just used old dining room chairs we had. Being the sap that I am, I felt there was a unique symbolism in gathering around a table that was built by my husband, hosting our very first family holiday. I can’t wait to make many more memories around that perfectly imperfect table. not the best pic of me and my mama but I’ll take it! 😉 Next year we’ll take more pictures of people! 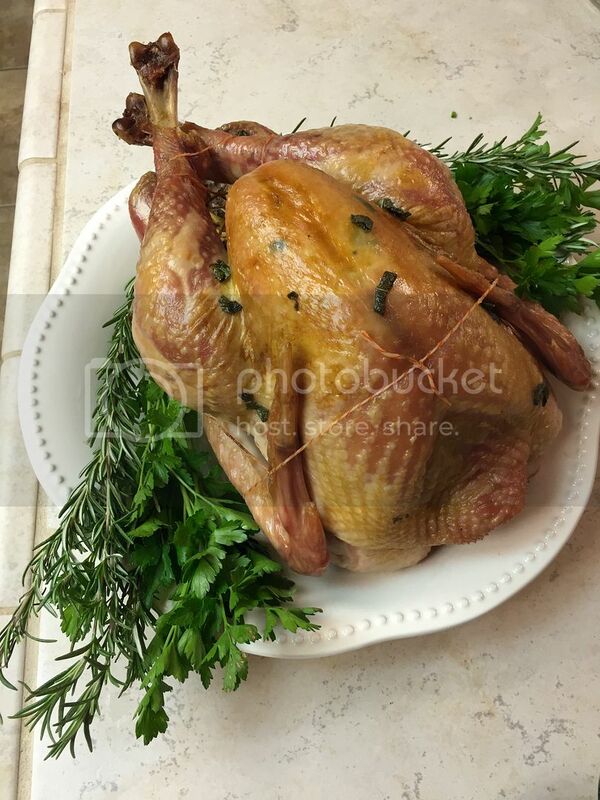 before: slathered with sage butter and stuffed with shallots, apples, lemons, celery and herbs. after! Don’t mind my amateur trussing job. It was delicious! Erik’s beautiful sister, her husband, and two sons (Olive’s cousins) — check out Olive’s awesome bedhead! Happy Monday, everyone! How is it already Thanksgiving week?! I am equal parts shocked and delighted. 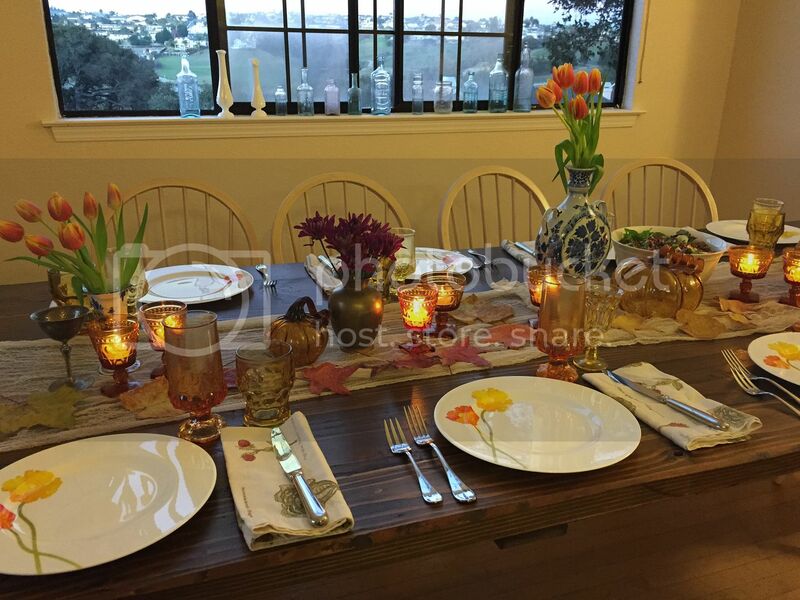 This year we have the pleasure of hosting Thanksgiving in our own home and I couldn’t be more excited. With all the traveling we’ve been doing this year, it feels great to just be home for the holiday. 😉 I also look forward to creating more of our own little traditions as a family as Olive gets older. If you follow me on Instagram, you saw a sneak peek of the reclaimed wood dining table that Erik is building for me. I can’t wait to set it for our Thanksgiving meal! Our favorite warm apple cider. It makes the entire house smell heavenly as it sits in the crock pot! Hope you’re having a great start to your week — see you soon! Happy Monday, everyone! Thank you SO much for all the love and encouragement you shared regarding my new logo/blog/site launch last week. I was so overwhelmed with gratitude for everyone who took the time to take a look and send some support. I’m sending out big virtual hugs! Today I thought I’d kick off the week with something sweet. Something decadently, indulgently sweet. I mentioned in a recent post that one of my favorite activities of my weekend with the Kaisers was making homemade ice cream. 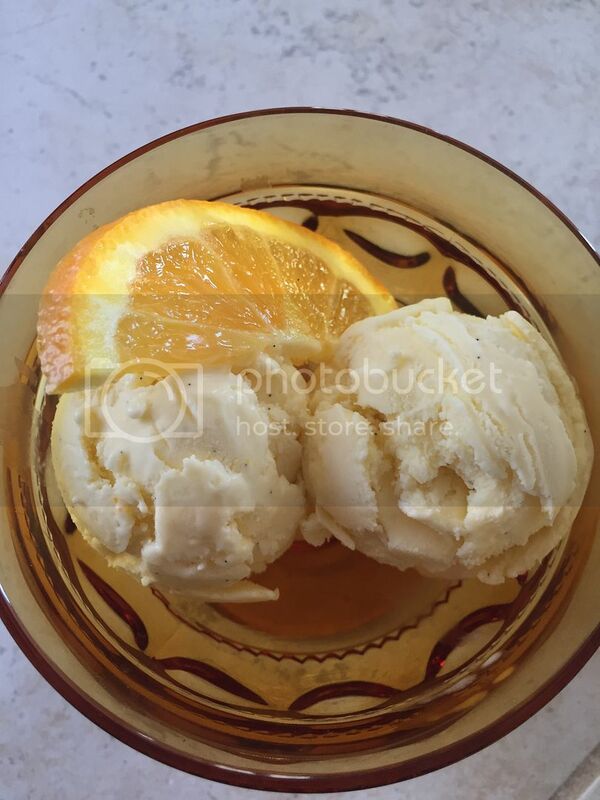 There is nothing like a rich and creamy batch of fresh ice cream, is there?? I let Grace choose the flavor we made and she was quick to suggest caramel. That’s my kind of girl! This creamy and buttery ice cream is mind-blowing. When Nate took his first spoonful he said, “WHOA. This stuff is legit.” And I don’t know if I can put it much better than that. It rivals any premium ice cream I’ve had anywhere else, and trust me when I say I’m quite the ice cream connoisseur. I can’t take credit for the phenomenal outcome since I used a recipe from who else — David Lebovitz aka the King of Ice Cream. But, I can tell you that it is worth the time it takes to make homemade caramel as your silky base. Grace and I had a Monopoly game to get to so we skipped the caramel praline mix-in (little caramel chips). I’m sure they would add some scrumptious texture but you won’t miss a thing without them. If you try it out, let me know. I bet you’ll love it as much as we did. Pour 1 cup of the milk into the metal bowl and put a mesh strainer on top of it. (You need a mesh strainer. Invest in one). Spread the 1.5 cups of sugar in a large saucepan in an even layer. Cook over medium heat, stirring constantly with a heatproof utensil (such as a silicone spatula). Gently stir the liquefied sugar from the edges toward the center until it is completely dissolved. Immediately remove from heat and stir in the butter and salt, continuing to stir. Once the butter is melted, whisk in the cream. At this point your caramel may harden (because you are adding cold/room temp ingredients to a hot melted caramel), but retirun it to low heat and continue to stir until it is amber liquid once again. Stir in the other 1 cup of milk. Whisk your 5 yolks in a separate bowl and then “temper” the eggs. This means you very slowly and gradually add in some of the warm caramel to the yolks, stirring them, and then add a bit more, stirring… If you just added the eggs to the caramel right away, you’d end up with scrambled eggs (eww). The goal of tempering is to bring the eggs up to the same temperature as the caramel in a very gentle way. I add the warm caramel to the eggs a spoonful at a time, vigorously stirring the entire time. When the yolks are warmed up, you can add (slowly) to the caramel and continue to stir. You want to heat this mixture up until it reaches 170 deg F.
Pour the custard over the mesh strainer into the milk (in that metal bowl over the ice bath). This helps in case you didn’t temper patiently and have some floating egg bits in your custard! It also ensures that the final product is super silky smooth. 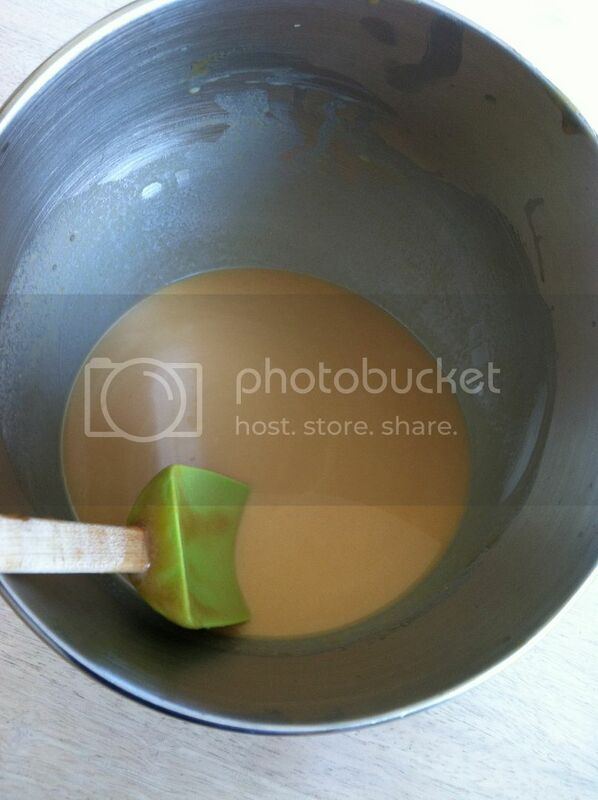 Add the vanilla and stir over the ice bath until the mixture is cool. Then, put the custard into the fridge for at least 8 hours, or ideally overnight. This is a KEY step — your custard must be thoroughly and completely chilled. If not, it won’t freeze completely in the churner and you’ll end up with soupy ice cream. Delicious, but soupy. Have a sweet evening and chat again soon! 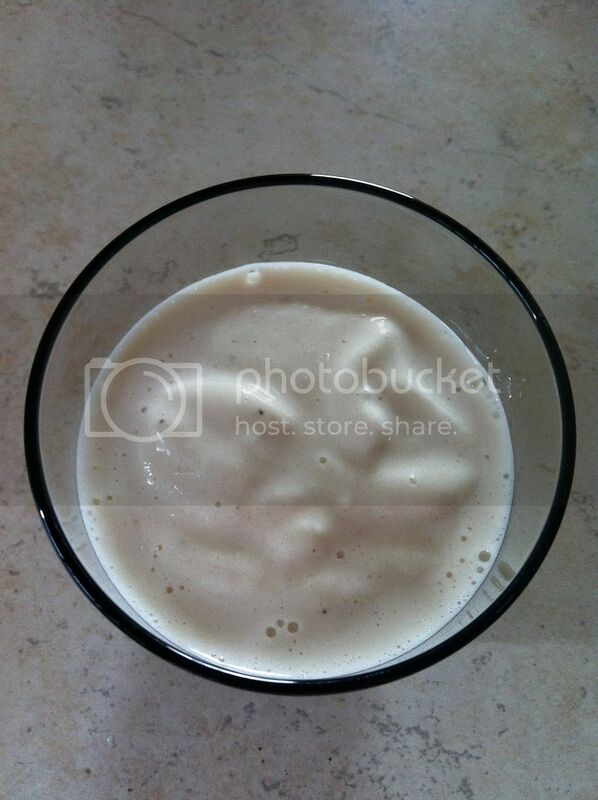 Have you guys ever had banana milk? It’s one of my favorite childhood drinks and lately I’ve been making it all.the.time. It’s healthy and totally guilt-free yet it feels like a treat. I don’t think you can consider this a recipe, since it’s ridiculously basic — you literally throw four things in a blender and whirl. But, if you have the ingredients sitting at home (I bet you do! ), give it a try and let me know what you think. I’m betting you’ll love it as much as I do. One frozen RIPE banana — your banana should be really ripe, with perfectly “freckled” skin. If you use a banana before its prime, you won’t get that yummy sweetness. 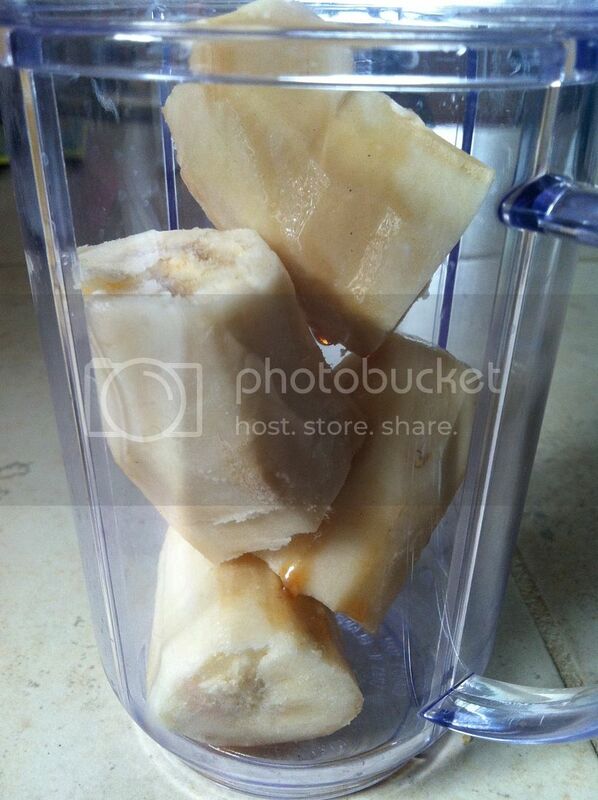 Cut up the frozen banana into four pieces and add to your blender with the other ingredients. Whirl until smooth. Add additional milk to make it thinner (more or a drink), add less to give it a milkshake/ice cream texture. What’s your favorite childhood treat? I’d love to hear. I LOVE entertaining, especially during the holidays, and it’s kinda coincidental that I’m having a dinner party for 8 tonight! 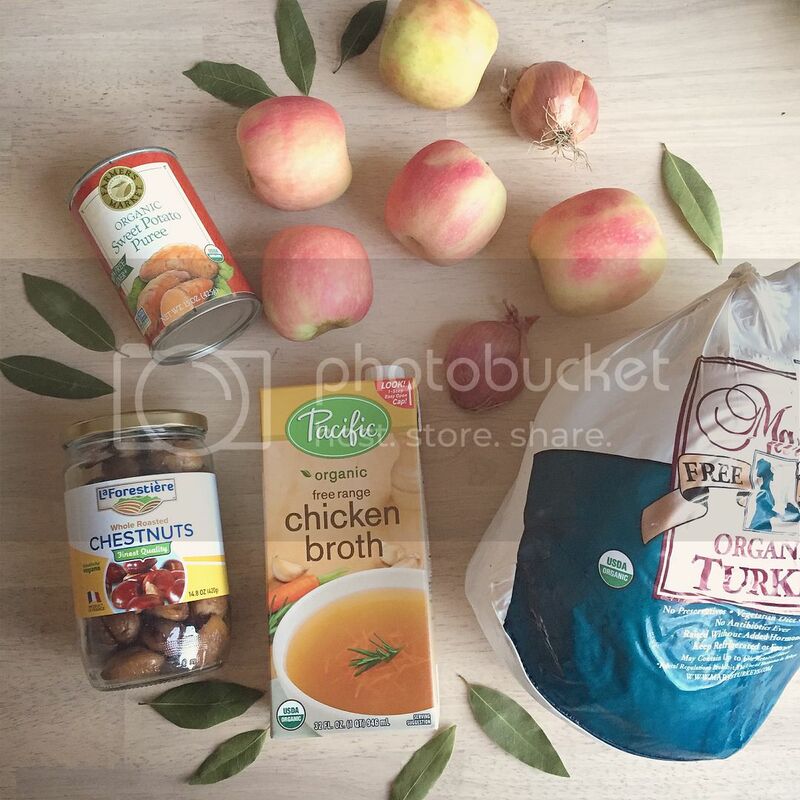 I mentioned in the guest post that one of my fall/winter entertaining staples is my hot apple cider. It is utterly delicious and I will take any excuse to make it. I am definitely making a batch for tonight’s festivities and I hope you give it a try, too. It’s wonderfully simple, makes the house smell divine and is an instant mood lifter! I always feel festive sipping a mug of cider, even if I’m alone in my PJ’s! I add fresh whipped cream and a drizzle of caramel to my cup but this delicious cider is sweet enough to enjoy on its own by the ladleful. Enjoy! 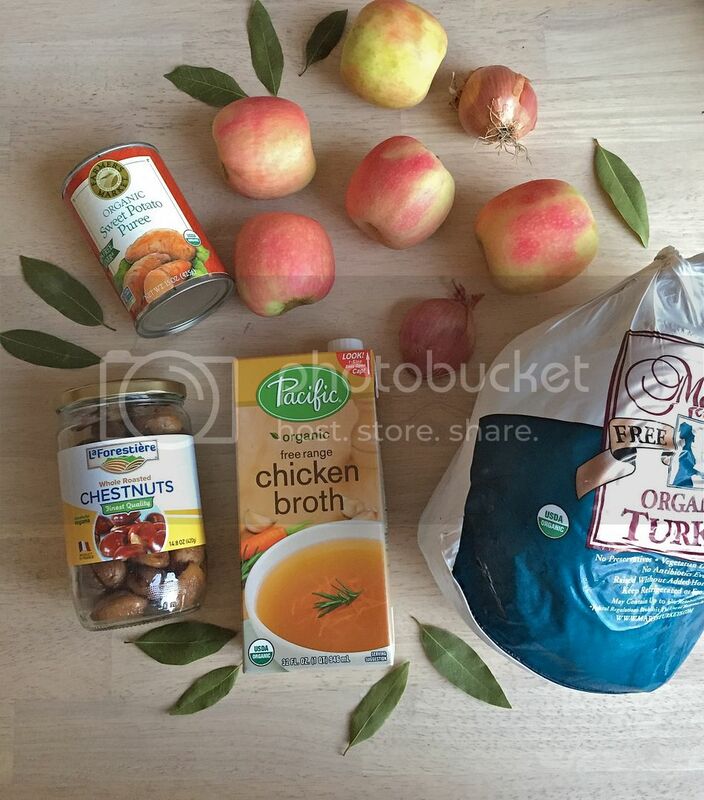 In a large crockpot, saucepan or dutch oven, combine the cider and OJ. 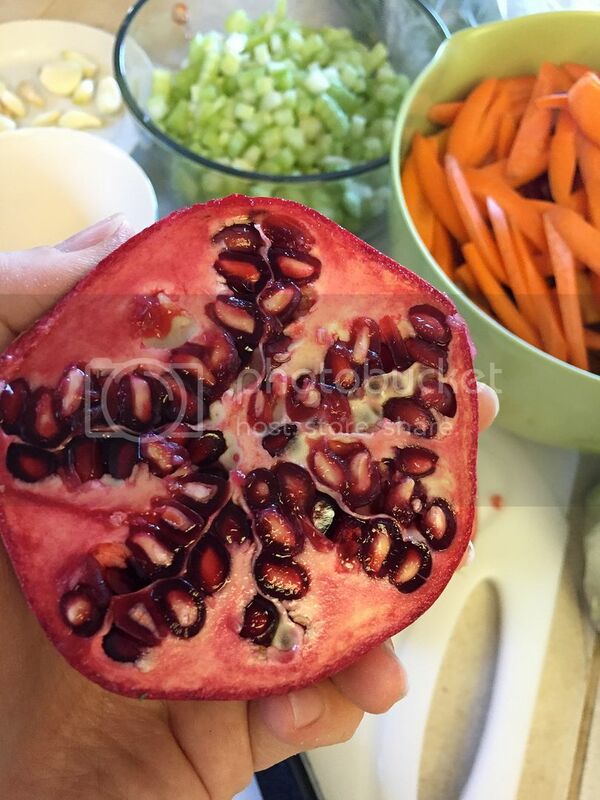 Slice the medium orange (five or six slices) and press the cloves into the slices (sort of like studding them! I like to press them in a pretty pattern). 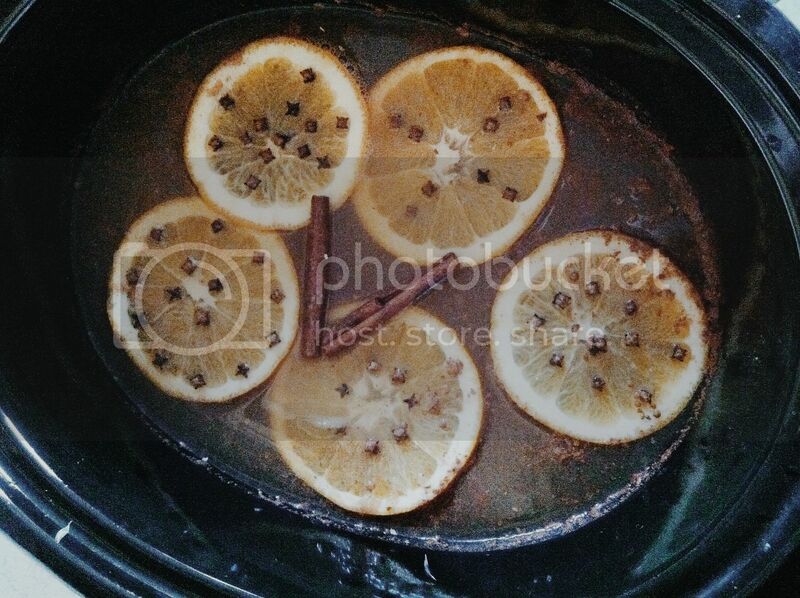 Float the clove-studded orange slices on top of the cider mixture. Add all of your spices and the cinnamon sticks. Stir gently to combine. If desired, stir in 1/4c of brown sugar. In your crockpot, heat on low for 3-4 hours. If using a saucepan or dutch oven, bring to a boil then reduce heat and simmer over low heat for 30 minutes to 2 hours. The key is to keep the heat LOW. 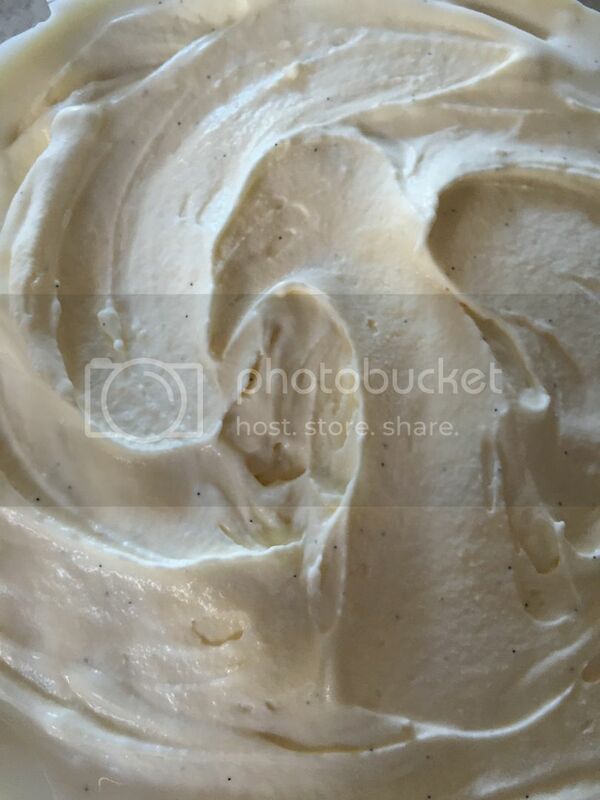 Ladle in to cups and add whipped cream and carmel drizzle as desired. 😉 Fresh cinnamon sticks make a lovely garnish as well! Enjoy!! 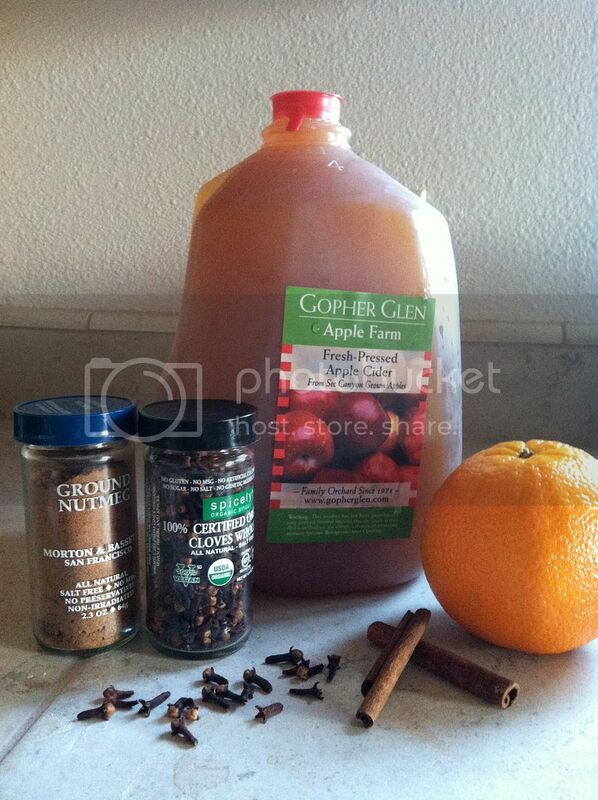 Let me know if you make some yummy cider for your holiday gathering! And don’t forget to check out the feature post on The Effortless Chic! It’s November and there’s no more denying it: autumn is in full swing! Last week was a total blur, with a trip out of town and lots of family and work outings. Right now I am furiously typing away on some catch-up emails while Olive snoozes. I’ve got a fresh cup of coffee by my side, but what I’m really craving is another slice of this delicious organic pumpkin cake I made last week. Enjoy this taste of fall! I just might make another batch tonight! 2 tsp ground organic cinnamon (or more if you like extra spice! In a medium bowl, mix all the wet ingredients together (eggs, oil/applesauce, pumpkin) until light and fluffy. Add the organic sugar. In a separate bowl, sift together the flour, baking soda, baking powder, cinnamon and salt. Stir the dry ingredient mixture into the wet ingredients and mix until well integrated. Spread the batter evenly into a buttered 10×15 pan (or a 9×13 and 8×8 pan). 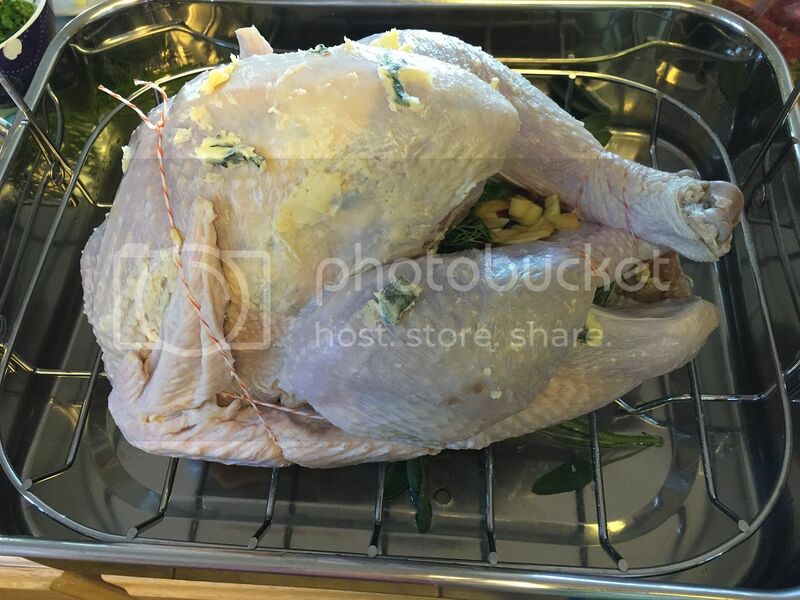 Bake for 25-30 minutes in the preheated oven. I checked mine at 18 minutes and again at 22 minutes to test for doneness. I was done in about 23 minutes. Let cake cool completely before frosting. 😉 If you want to make the frosting, cream the butter and cream cheese together. Add the vanilla and then mix in the powdered sugar little by little until smooth. Spread evenly onto the cooled cake. Or, keep in the fridge (a couple days max, if your cake lasts that long!) and use to slather individual slices as desired. Let me know if you give it a try! Happy weekend! One of the most important things in life is to be flexible. I’ve learned this lesson tenfold as a mom — schedules need to have some give and I need to be willing to go with the flow, even when life “interrupts” my carefully laid plans. 😉 This weekend we did not end up going to the Harvest Festival, after a very busy and productive Saturday working on the front yard. We actually drove through town during the last hour of the festival and everyone was already packing up. Whoops! We still had a lovely and relaxed Saturday night, though. Then yesterday, my sweet friend and her daughter got sick so we had to postpone their visit (with my other friend and her son!) planned for today. That means that after church, instead of cleaning the guest room, I decided to take a much needed nap. haha And I’m glad I did! I never get to take naps anymore, so it was a blessing in disguise. With all the changed plans and a freshly shattered iPhone screen (I forgive you, Olive), last night definitely called for some easy comfort food. I decided to make this hearty organic beef stew for dinner and it was a big hit with both Erik and Olive. 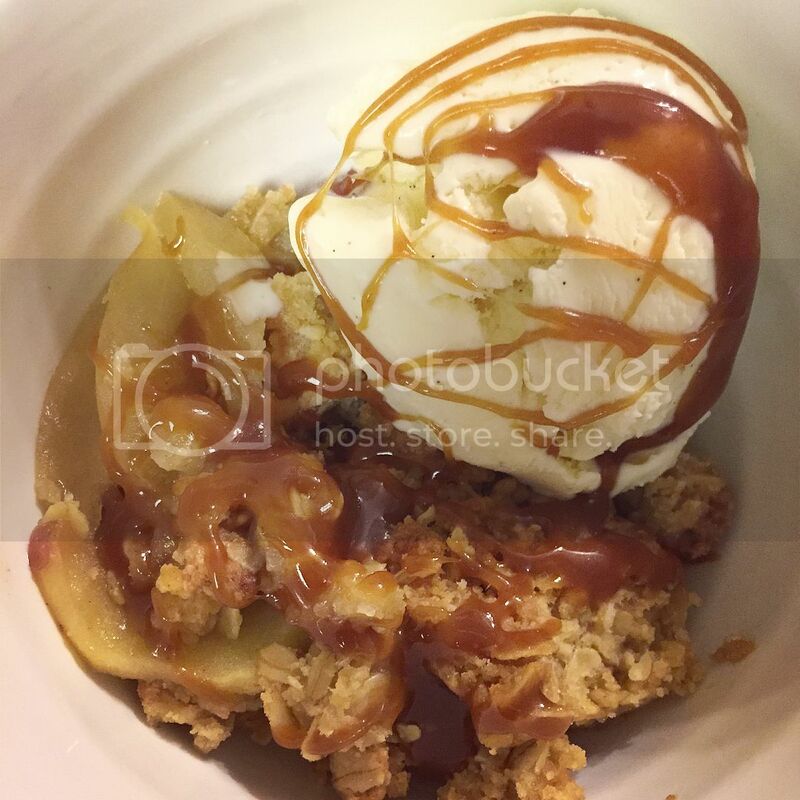 After posting a photo on Instagram, I was asked to share the recipe here. 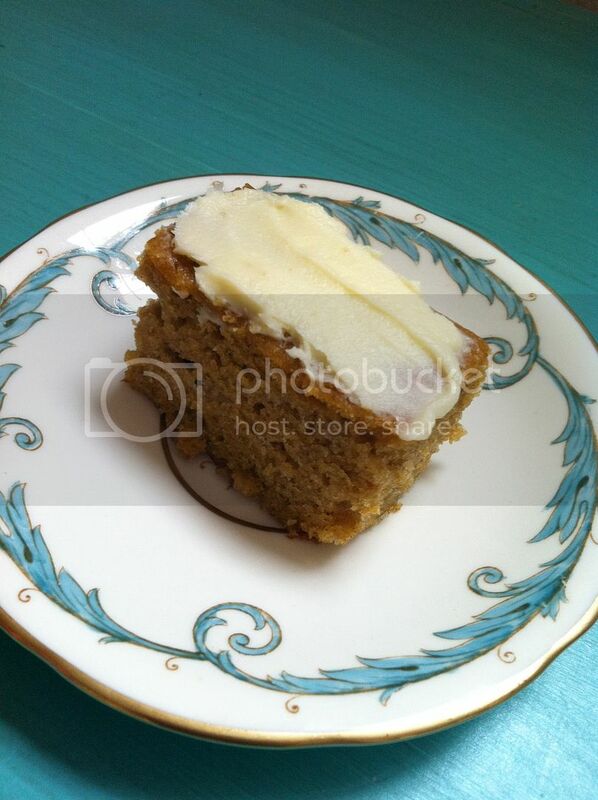 I’m happy to do so, but I apologize for the lack of photos since I didn’t originally plan to blog the recipe. This yummy stew is perfect for chilly autumn and winter evenings and it makes great leftovers, too! 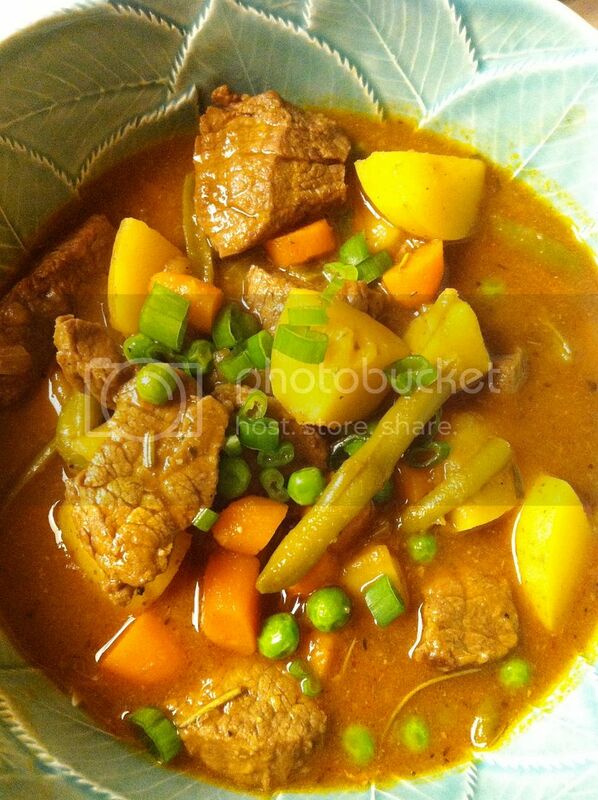 Stews and soups are always always always better the next day, as the flavors really meld and develop overnight. You’ll noticed that my ingredient list is very rough. Trust yourself and taste as you go; I think you have to feel things out with a stew and add according to preference. I like a really chunky stew with a lot of “stuff” in each bite, so I go heavy on the veggies. Various spices (fresh or dried, to taste): rosemary, oregano, sage, thyme, smoked paprika, etc. Put stew meat in a ziploc bag or deep bowl with the flour and add salt and pepper. Seal bag and shake to coat, or toss in the bowl gently with a wooden spoon, ensuring all pieces of meat are lightly dusted with flour. Shake off excess and discard remaining flour. Pour in your beef stock slowly, scraping up any bits at the bottom of the pot. Mix in your veggies (I did carrots and potatoes at this point) and then add your tomato paste and worcestershire. Add your spices and salt & pepper, and two bay leaves. Stir gently to combine and place lid on top of the pot. Turn down the heat and simmer gently for at least 30 minutes, up to 1.5 hour. I can’t help myself and I like to open the pot every 15-20 minutes to stir the stew and inhale the yummy scent! In the last 15 minutes of cooking, I added the haricots verts because I don’t like them to get too soft. If your stew is too thick, add some broth. If it’s too thin, add a bit of roux. Taste and adjust seasonings before serving. Remove bay leaves + ladle into bowls. Top with sliced green onions and enjoy! Last night I made potato salad (by request) for Bible study and I jokingly told my friend that if I’m making potato salad, it must still be summertime. This creamy, tangy, nostalgic side dish is so deeply ingrained in our American notions of summer that it is hard to imagine eating it at any other time of year. But hey, if I’m not the only one who craves stuffing and pumpkin pie in May, I can’t be alone in my year-round love for a good potato salad. Here is my simple recipe for a good ol’ American classic. Boil potatoes and eggs separately in lightly salted water. My eggs take about 10-12 minutes, and then I let them come to room temperature in cool water. Peel carefully and roughly chop. The potatoes took about 15 minutes but I prick them with a fork constantly at the end to get that perfectly tender level of done-ness. Nothing is worse in potato salad than undercooked, crunchy potatoes. 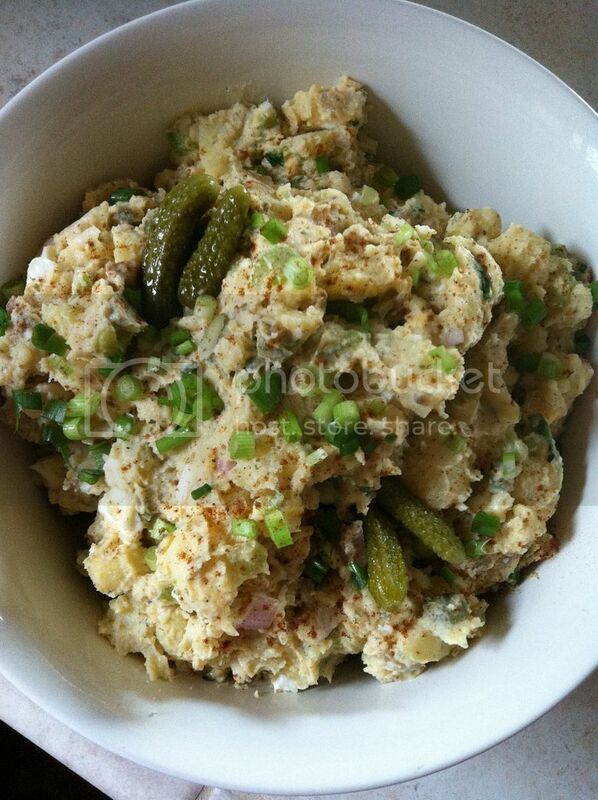 In a large bowl, combine the mayonnaise, mustard, celery, shallots, dill, cornichons and green onion. Mix to create a smooth dressing. When the potatoes are done, drain them and cut into small chunks. Mix them into the dressing while they are still warm. Add the chopped eggs and season liberally with salt and pepper. Taste, add the cornichon juice, and adjust seasonings as needed. I always end up adding more salt, mustard and cornichon juice! Cover and refrigerate the potato salad for a couple hours, then re-taste and re-season if needed. Potato salad tastes even better the next day, as the flavors really meld together. Serve cold or at room temperature (for best flavor), garnished with more green onions, some cornichons, and a dusting of paprika! If you end up trying this recipe, I hope you enjoy! What is YOUR essential summer food? Los Angeles Times // The TASTE Giveaway! Happy Friday, L&S readers! I hope this sunny soCal day is bringing you smiles. 🙂 And if you’re not already smiling, I hope this post helps bring one to your face. I’m checking in, saying a quick hello, and am back with a giveaway for Labor Day weekend. For the L&S Angeleno readers, you may have heard about the scrumptious and action-packed Los Angeles Times // The Taste. It is their annual food and wine festival which is taking place once again in Hollywood at Paramount Pictures Studios. We are excited to announce a giveaway for a pair of tickets (2 total, valued at $125/ea ticket!) to Opening Night on Friday evening, August 30th (7:30p-11:30p). This particular event is new to the schedule but is sure to be a very special treat with all The Taste hosts and co-hosts including LAT’s very own Russ Parsons and Jonathan Gold, as well as Nancy Silverton – Pizzeria Mozza, Michael Cimarusti – Providence, and Sang Yoon – Father’s Office) in attendance. Plus with the smaller capacity on Opening Night, you are sure to get your fill of yummy tastings from Bagatelle, Bedford & Burns, Carson House, Fishing with Dynamite, Mo-Chica or Phorage, to name a few. If you’re curious about the other events at The Taste, still on the menu are favorites from last year including Field to Fork, Flavors of L.A. (general admission currently sold out, but limited tickets are available with the Secret Cellar upgrade), Labor Day Block Party (the only all-ages event on the line-up) and Cocktail Confidential, which will close the weekend off on Sunday night. We’re looking forward to spending another great weekend with local and celebrity chefs, delicious restaurants, tasty libations and a plethora of cooking demos. Check out the official website to learn which Times food writer or critic will be hosting each event, read up on the chefs scheduled for cooking and/or bar stage demonstrations (did someone say Michael Voltaggio – ink and Robin Chopra – Corazón y Miel? Yes, we did! ), or just let your mouth water as you review the long list of restaurants participating at each event. Hungry yet?? Here are the simple instructions on how to enter for your chance to win a pair of tickets to Opening Night at The Taste! Make sure you also ‘LIKE’ us on Facebook! Comment below and let us know your favorite meal in Los Angeles. Is it a simple dinner with your family enjoying comfort foods, or is it an all out fancy affair at one of the city’s top restaurants? Give us the yummy details! That’s it! To ensure your name is added to the random drawing, please follow all instructions above. We will accept entries until Tuesday, 8/27 at 10 a.m. PST. The winners will be announced shortly thereafter! Of course, remember that the events are in Los Angeles so we apologize to our non-local readers (unless you are ready to road trip!). **Please double-check your schedule to confirm that if you are the lucky winner, you will be able to attend Opening Night on Friday, 8/30 in Hollywood. These tickets are not transferrable to any of the other weekend events. Best of luck to all entrants; have a fantastic weekend!! Continue to find what you love and truly enjoy it.